As the PCUSA divestment debate winds to a conclusion, I’ve been surprised how difficult it’s been to gin up the emotions (anticipation, gloom, excitement) that usually come to the surface in the run-up to a big BDS vote. Perhaps I am simply suffering from a sense of false optimism, hoping that the divestment measures that have passed the vote of a stacked and/or largely uninformed committee will be voted down in the plenary (the same dynamic that played out during previous Presbyterian votes on the subject). But given that, even on good days, I figured BDS stood a better than 50:50 chance of passing this week, optimism cannot explain this atypical lack of anticipation. It’s possible I’m simply protecting myself (both emotionally and politically) in case the church does decide to rejoin the BDS movement by convincing my mind and heart to be indifferent to the results. But given the level of enthusiasm I recently felt during a far more important BDS battle (the Methodists) and a far less important one (Park Slope Food Coop) – two votes with outcomes just as uncertain as the Presbyterians – this doesn’t feel like either an intentional or subconscious game of managing expectations. Perhaps I have been hanging around BDSers so long that some of their lessons have rubbed off on me. After all, the boycotters never let their repeated failures get to them – or even acknowledge to themselves or others that they have suffered a setback. Have they ever responded to questions as to why, if their “movement” has been so successful, that investment in Israel has skyrocketed during the BDS decade? Have they ever been willing to acknowledge the fact that their “victories” (such as the Olympia Food Coop and even PCUSA in 2004) are exceptions that prove the rule (since no other food coop or church has shown the slightest interest in buying their snake oil)? Given that divestment champions will never acknowledge the endless victories of their opponents, or even respond when caught trying to pass off lies (such as the recent TIAA-CREF hoax), it’s not entirely clear why Israel’s supporters need to respond to every one of their baits, just because a hundred BDS Twitter feeds insist we must. Digging a little deeper, however, there are some emotions I’d rather not confront that might be short-circuiting the usual feelings of anticipation accompanying a major BDS battle: disappointment laced with a fair amount of disgust. The fact that there is nothing approaching consensus on this political opinion within the church means nothing to the boycotters and their enablers, an indifference matched only by the belief that the Jewish community’s patience with being kicked in the teeth on a bi-annual basis is endless. And if this vote might lead to more hardening of positions on both sides, leading to more suffering and greater chances for conflict, what do the divestment-volk care? All they want is the right to be able to brag that they brought PCUSA back into their fold, regardless of the cost to anyone else inside or outside the church. In the past, I’ve been able to pin blame on this bi-annual misbehavior on radicals inside and outside the church who have made it their life’s work to drag the organization under their umbrella. But looking at the behavior of too many Presbyterians this time around, I can’t help but fear that the cancer represented by BDS attitudes has spread beyond a core group of fanatics. We’ve all grown used to the manipulative arguments, the truncated versions of history, the silencing of dissenting voices that have accompanied PCUSA divestment debates in the past. But the level of dishonesty accompanying this year’s debate seems to indicate that the church’s readiness to bear false witness is climbing close to the same level as the one practiced by the BDS “movement” as a whole. Why else would long-ago debunked fake Nelson Mandela quotes not get called out when they were brought up before not one, not two but EIGHT church forums dealing with the divestment issue? 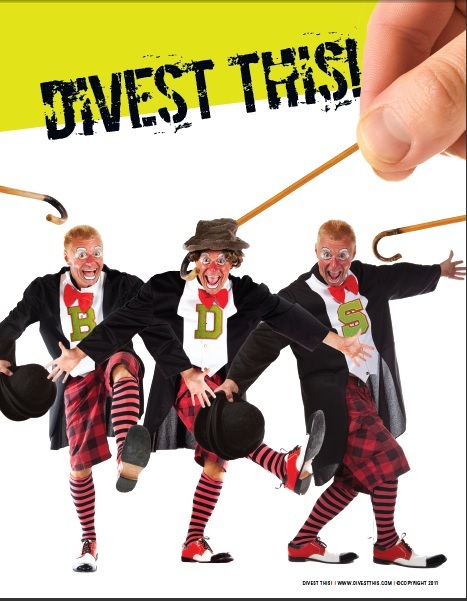 Why would committee members contort the language of their resolutions and discussions to claim that divestment was something other than divestment and a boycott something other than a boycott? And why would they pretend that this entire debate was a continuation of an ongoing discussion of corporate engagement, rather than the recycling of divestment resolutions rejected three times before? Having gotten to know many kind and thoughtful Presbyterians over the years, I suspect my current emotional state has something to do with the sympathy I feel for their pain as they watch a church they have dedicated their lives to become a place best characterized for its dishonesty, hypocrisy and impotence. Israel and its friends certainly have nothing to fear if an organization like PCUSA decides to embrace these three characteristics by ignoring its members, ignoring its friends, and ignoring its mission to make joining the BDS “movement” its top priority (leaving just enough time to simultaneously manage a vanishing membership and internal civil war). No doubt I’ll be watching video feeds of the final debates and votes (unless the kids want to do something outside while those debates are going on), but I shall do so with an air of melancholy as a church with a 400 year old history demonstrates its readiness to join other organizations (such as the Green Party – remember them? I thought not.) that have clutched BDS to their breast as they sunk beneath the waves for the third time. The most disgusting part of the PCUSA divestment is the choice of their targets. They say that Motorolla is a part of their 'moral' wrath for providing surveillance equipment to Jewish settlements. Do they mean that the Palestinian human rights that PCUSA claim to champion, include unimpeded murders like that of a Fogel family? Palestinian terrorists from a nearby Arab village penetrated the electronic settlement fence and slit throats of three small children and their parents sleeping in the house. These confessed and convicted murderers become heroes in their village. Did PCUSA ever heard from Jewish survivors and victims families of dozens of such attacks? Did these moral stalwarts condemn the murderers and their glorification in the PA? By targeting Motorola's purely defensive role, PCUSA sends a clear message that these Jewish families are not deserving to be protected, that their right to life is not a human right. Well, someone needs to tell PCUSA that Jews will no longer be slaughtered like sheep, defenseless, in pogroms like 1929 Hebron. As far as Caterpillar, did PCUSA ever issued a condemnation statement when a Palestinian Arab commandeered a CAT bulldozer and run over Jewish motorists and pedestrians on a street in Jerusalem? A mother who was able to throw her baby out of the car seconds before it was smashed was killed. Is that the reason for the PCUSA CAT divestment? As far as HP and Israeli Navy, who knew that West Bank is on a sea? Perhaps PCUSA is upset about Israelis intercepting explosives that Hamas terrorists who rule Gaza have been deploying into the Mediterranean and some of which have been washing on Israeli shores? Blowing up Israeli beaches is apparently another Palestinian human right that PCUSA is so concerned about. PCUSA is sending a clear message that their moral standards preclude any Israelis from defending themselves against Arab terror and military aggressions. Yes, because an isolated incident in which a rogue Palestinian commandeers a CAT is morally equatable to an Israeli government policy that has led to the demolition of thousands of Palestinian homes in the past decade. Yes, because the deplorable murders of the Fogels justify the sustenance of internationally condemned and illegal settlements that have claimed the majority of the land in the West Bank and leave Palestinians segregated into cantons. Yes, because crude missile fire from Gaza justifies the use of HP equipment in illegal checkpoints in the West Bank that severely impedes upon the freedom of movement and commerce for two and a half million people. I encourage you to reconsider your opinions with something called “scope” in mind. If anyone is interested, the above is an example of a rhetorical strategy called “The Pointing Figure,” in which you acknowledge the charges made by your opponent, but only to turn around and use them as the basis for your own set of even greater accusations. To use this strategy effectively, it’s good to use words such as “isolated” and “rogue” (to shrink the circle of guilt as much as possible when discussing your own side), “crude” (to minimize or even trivialize crimes such as the firing of rockets at civilian populations) or “deplorable” (which you can point to later to demonstrate your even-handedness when confronted with the death of someone other than Palestinians). If you’d like to send me a draft of your next comment before posting it, I’d be happy to do a quick review on it. Hell, Hamas has used Cats to bulldoze Palestinian homes in Gaza. Not only didn't they condemn Cat, that didn't saying anything. These people don't care about Jews or Arabs. Exactly – at least the actions they have taken indicate they only care about themselves. It's a kind of moral arrogance and narcissism that is actually patently immoral. What this dictated what that even when anti-Israel activism was not the will of most Presbys, it would continue. Now most Presbyterians don't care anymore. Until now, I think we’ve counted on the people in the pews doing the right thing to avoid a tragedy that BDS fanatics both inside and outside the church, allied with a corrupt leadership, seem so eager to cause the denomination. But you are right that a church membership with other life (and church) priorities cannot always be counted on to stand up to the bullies GA after GA. The fact that the leadership is counting on this weariness (as well as forgetfulness of what happened in just the recent past) is only a greater demonstration that they could not care less about the consequences of their actions, or with the fact that they are leading the denomination to the brink.